Launched originally on iOS, BADLAND (and yes, the name is deliberately all in capitals - sigh) is a lavish side-scrolling adventure that combines lots of familiar gameplay elements into an atmospheric whole, as your bumbling character tries to make it through an obstacle-strewn forest. It has now been launched on Windows Phone, see the links below. ...BADLAND also features highly original local multiplayer for up to four players playing with the same device. The multiplayer is all about survival of the fittest with no rules. It’s completely okay to push your rivals to spinning circular saws in order to survive. Or, if that's too rough for you, you can also co-operate with your friends by playing the modified single player campaign together with your friends supporting up to four players. The standard of graphics and lighting effects in BADLAND is impressive, it's clear that production values (and budget) were both very high here - the game now claims over 15 million players worldwide, though it's not at all clear whether this is sales or just downloads, or even including the single-device multiplayer mode in the number! BADLAND was first launched early in 2013 on iOS, so the arrival on Windows Phone is somewhat tardy - we've seen some other game titles arrive within days across all mobile platforms, so don't take the year gap here as exemplary. 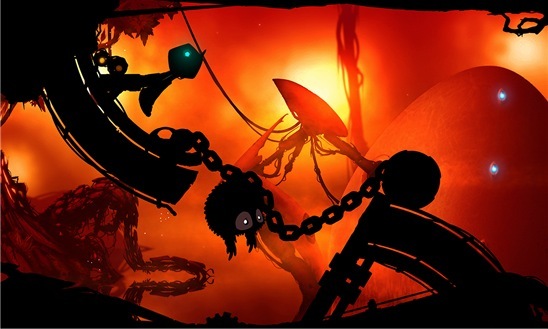 You can grab the trial version of buy BADLAND here in the Store.